Great per smoothies & baking. Per 3 tbsp: 70 calories. 0 mg sodium, 0% DV. 8 grams of protein per serving. 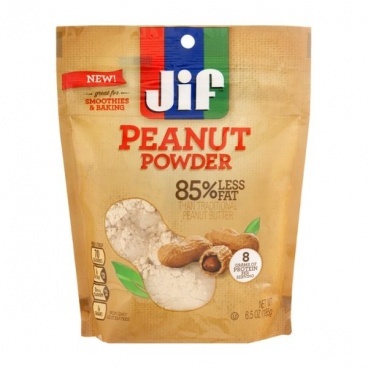 2g fat per serving of peanut powder compared to 16g fat per serving of peanut butter. *Not made genetically modified ingredients. Trace amounts of genetically modified material may be present. Made by pressing our freshly roasted peanuts, Jif peanut Powder lets you bring a classic peanut taste to any snack with 85% less fat than traditional peanut butter. Stir into your smoothies or try baking with it - the possibilities are endless. Instructions: Reconstitution directions:Peanut powder - water - sugar or honey (optional) - salt (optional):3 tbsp - 1 1/2 tbsp - 1 tsp - dash.Stir peanut powder, water, sugar or honey and salt until smooth.